The people of Detroit have come together to breathe new life into their city in a pretty amazing way, but none of the Motor City’s totally amazing developments put it in anywhere near the same league as my totally decked-out house. 1. The Beehive Recording Company: The Beehive Recording Company records songs by Detroit-based artists for free as a way to bolster the city’s homegrown art scene. I applaud the city’s noble effort, but it’s no match for what I’ve done for the music scene in my house with the surround sound system I installed in my garage last May. Come listen to the Grateful Dead’s set at the Nassau Coliseum from May 6, 1981, blasting out of my in-wall speakers on a summer Sunday, and the city of Detroit will be the furthest thing from your mind. 2. Atwater Street’s RiverWalk: All right, here’s Detroit playing hardball with a beautiful new riverside path for biking and walking. The skyline views of the city from the RiverWalk are nice to look at, sure. But I currently have a reputable team of roofers upgrading my roof to ceramic tile. There will soon be no leaks in my roof whatsoever. It’s a perfect roof—I’m talking complete protection from the rain—with a fun Mediterranean vibe to boot. Does the RiverWalk have a roof like that? Frankly, there’s no way that it does. Nice try, Detroit, but you aren’t my house and never will be. 3. The Corktown dining scene: I’ll give Detroit this: The boom in its restaurant scene over the past few years has been incredible. The city’s Corktown neighborhood is home to dozens of hot bars and restaurants with classic Detroit vibes, like Katoi, a Thai restaurant that’s housed in an old auto mechanic shop. Unfortunately, Detroit is missing one key ingredient: my wife, Sherry. Would you rather eat out at a crowded BBQ joint or have spaghetti bolognese served to you by Sherry Pearson, the most beautiful woman I’ve ever met? And if you think you could get Sherry to move to Detroit, good luck. She would not leave me for the world. 4. Street art: I painted our family dog standing in the woods. It is a perfect likeness. I did this with no training whatsoever. It hangs above our fireplace. Detroit artists are filling the city with beautiful murals but none like my painting of Shadow. 5. Campus Martius Park: The beautiful, totally revitalized city of Detroit cannot touch my DVD collection, and that is a simple fact. Caddyshack, The Princess Bride, Mission: Impossible—Ghost Protocol—these are just three of dozens. The several entertainment stages and the ice rink at Campus Martius Park seem like a lot of fun, but at my house we fire up Arbitrage and get our Richard Gere on at least once a month. With all due respect, Detroit, I would like to see you try to top that. 6. 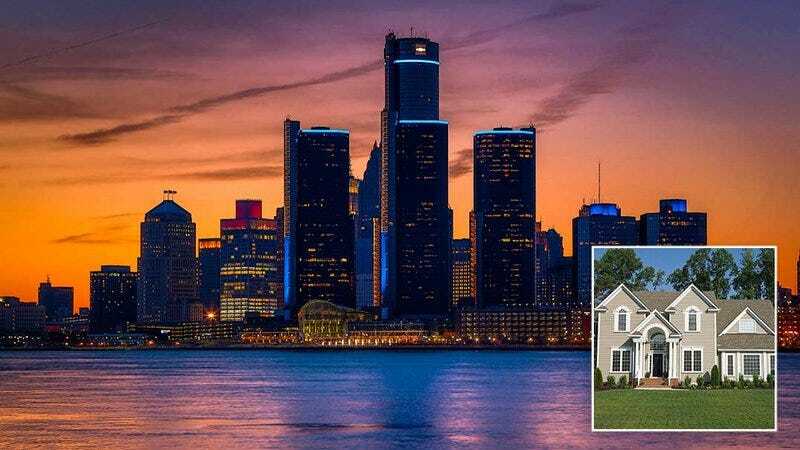 The Detroit Land Bank: Organizations like the Detroit Land Bank have made houses in Detroit affordable for young people. But consider this: My stepson Lance has been living in my basement for three years since he graduated from school, and it’s pretty affordable for him, given that all he has to do is wake up before noon and sweep the kitchen floor once in a while, for god’s sake. Sorry, Detroit, but I’m a few steps ahead of you on this one. You’ll get there someday!